So I guess it’s fair to say at this point that the current Bride of Frankenstein storyline is not setting any land speed records for Dark Shadows. It’s been dragging on for weeks, and the Bride is still just a bandaged-up mannequin, lying on the lab table and not even bothering to decompose. Still, it’s part of Dark Shadows’ nature that even in its darkest and most shadowy hours, they’ll find something to do that justifies our patience. Today’s episode is weird and disappointing in several ways, but the cliffhanger sets up one of my favorite lunatic plot contrivances. When I am old and gray, and the world has taken everything from me but my basement murder lab and my hypnotic medallion, I will think of today’s cliffhanger, and a flicker of a smile will play across my careworn features. 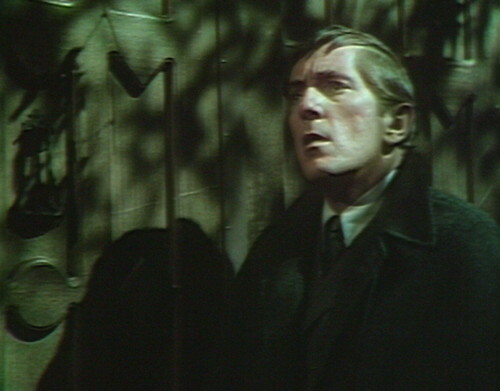 As the episode opens, we find barely-reformed vampire Barnabas Collins on the verge of revealing all of his secrets. These include: #1) using his life force to bring a Frankenstein monster to life, #2) allowing the monster to bully him into creating a Bride, #3) setting up a mad science lab in his basement, #4) using Carolyn as the life force, knowing that it would probably kill her, #5) killing her, and #6) being a vampire in the first place. There are also quite a few secondary secrets, of course. Barnabas is responsible, either directly or indirectly, for at least four other unsolved murders that I can think of off the top of my head, but let’s take this one step at a time. You can’t confess to everything all at once. Anyway, Carolyn is the one that he actually feels bad about, because she’s a member of his family, so he’s come to Collinwood to give everyone the bad news, and then I guess hand himself over to the authorities. This will be quite a feather in the cap of the Collinsport police force, who have never actually brought a suspect to trial before. Oh, but never mind; Carolyn’s fine. She was brought back to life by an evil wizard, apparently, and now here she is, and we’re just having a regular scene. It’s a cheap trick, really, pretending to kill Carolyn on Tuesday and then having her pop up alive again at the end of Wednesday, and it’s widely resented by Dark Shadows fans. It’s not the cheapest fake surprise that they’ve ever done, but there’s something about it that rankles. We know that Nicholas Blair has the power to bring dead people back to life — he brought Angelique back twice, in the space of a month — and even if he didn’t, there doesn’t have to be any particular logic to his abilities. 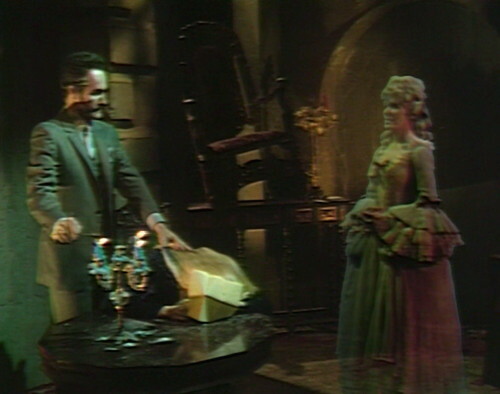 Magic on Dark Shadows runs on pure narrativium, the natural force that powers storytelling. 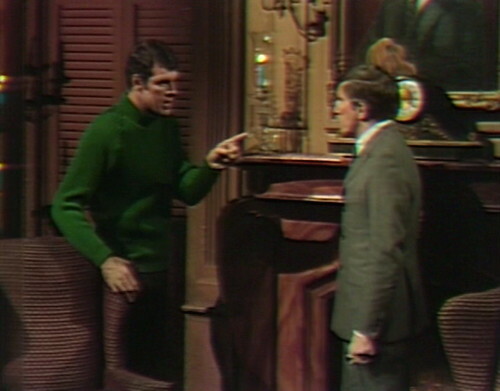 Besides, people mysteriously coming back to life is one of Dark Shadows’ core competencies. And it’s not that I mind Carolyn coming back. Carolyn is great; nobody wants her off the show. It’s the same reason why Angelique keeps coming back, despite being murdered every couple of months. But Angelique coming back to life is exciting, while Carolyn’s resurrection falls flat. I think the problem is that they just promised us some catastrophic story progression — Carolyn’s dead! Julia is arrested! Barnabas is hunted! The entire show explodes! — and then Carolyn opens the door, and restores the status quo in an instant. Angelique’s return always opens up new story threads, which is why she’ll continue to make last-minute escapes for the entire run of the series. 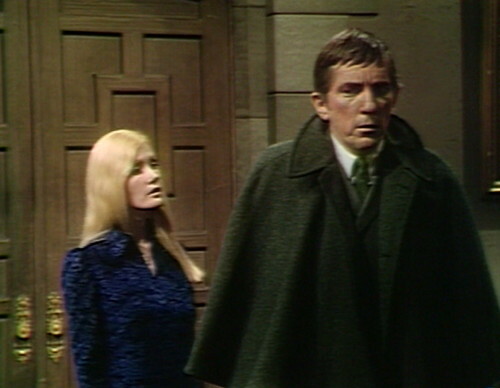 But here, Barnabas is about to make a huge story point happen, potentially the biggest change in the show since he came out of the mystery box — and Carolyn is literally standing in the way, barring the door. It’s deflating. Anyway, back to the salt mines. 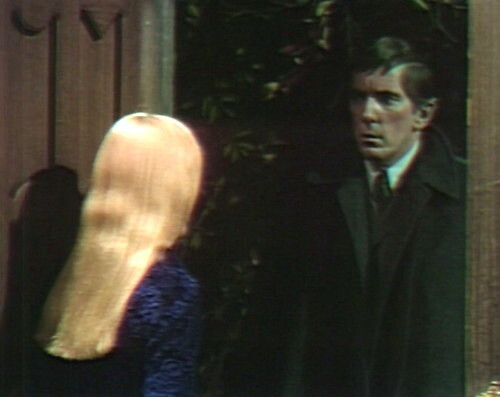 Adam shows up at the Old House and starts wagging his finger around, demanding that Barnabas and Julia run the experiment again, using someone else as the life force. Barnabas asks who they’re going to use, and Adam tells him to mind his own damn business. Barnabas says that they can’t start without Julia, and he doesn’t know where she is. She doesn’t actually appear in this episode, which is odd, because she was just here yesterday, and they’re still in the middle of the same crisis. 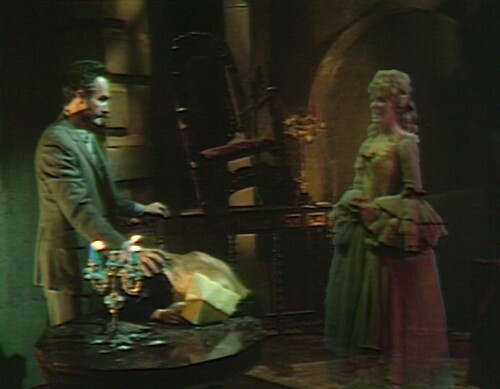 There are actually three different spots in this episode — once in each act — when Barnabas wonders helplessly where Julia could be. This is because Barnabas is not in charge of this storyline in even the tiniest way. So Nicholas leads Carolyn down to his own weird basement man cave, and sits her in the middle of a magic circle. He tells her that she must be sure not to leave the circle, and she says why, and he says, “The one that I am about to summon from the grave would kill you.” This is what conversations with Nicholas are like. His big idea is to summon Danielle Roget, a mass murderer who lived during the French Revolution. He explains that Danielle doesn’t have anything against Carolyn in particular; it’s just her thing. 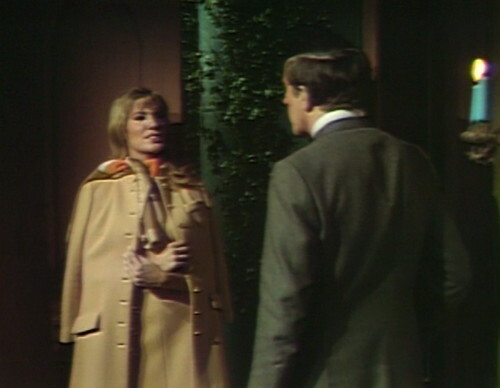 Now, this is one of those unheralded milestones in the history of the show that I like to examine and catalog: Danielle Roget is the first character on Dark Shadows who’s just Evil with a capital E.
You could make the case that Nicholas himself should be the first Evil character, because he’s literally trying to create a race of Satan-worshipping homunculi, but Nicholas is too well-bred to be truly Evil. He makes plans; he invites people over for drinks. For all of his elaborate mustache-twirling, he doesn’t really want the whole world to burn down. He just wants to play with it. But Danielle is the first of a truly new race of Dark Shadows monsters — a character who has no real motivation or goal besides destroying everything she touches. Judah Zachery is probably the premier example of this archetype — we’ll meet him in late 1970 — and you could also make a case for Count Petofi, John Yaeger and the Leviathans. But Danielle is the first person who engages in purely performative evil, just for the lulz. So here she is, in glorious Chromakey — our special guest, Danielle Roget. And, as advertised, the very first thing she wants to do is murder Carolyn. “You know that that is not possible,” she says. The conversation gets a little complex. Nicholas: There is no time for explanations. Appear before me, here, in this room, when the clock strikes three. I will tell you all you need to know. Danielle: Do not banish me now. Allow me to destroy the girl. Nicholas: No. Return to your grave! Danielle: Do not spare her. Allow me to watch her die. Then he puts out the candles and says “Return to your grave” again, so she returns to her grave. I’m not super clear on what the difference is between her appearing to him now or when the clock strikes three. This is the nonsense that you’re going to get from her, no matter what time it is. This is what Danielle Roget brings to your life. 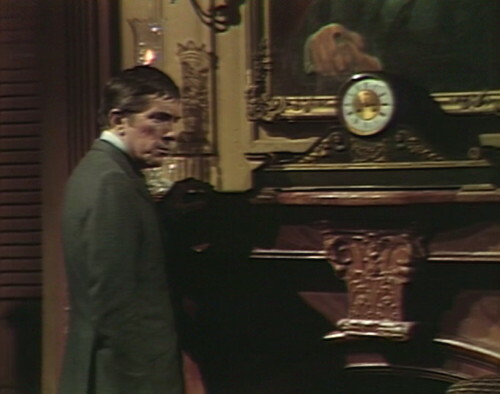 Okay, back to the Old House, where Barnabas is still standing around and wondering where Julia is. He’s hopeless, entirely hopeless. There’s a knock at the door, and he finds a stranger. “Adam asked me to come here,” she says. So there you have it — one of my all-time favorite cliffhangers. It’s not the scariest, or the most heartbreaking. It’s not a major milestone for the show. And yet I could watch it a million times, and I will love it until the day that I die. Leona Eltridge! It’s ridiculous. And that’s why Dark Shadows is my favorite show. When Nicholas carefully walks Carolyn back to her seat in the center of the circle, a camera briefly enters the frame on the left. As Nicholas quickly puts out the four candles, one remains lit and has to be snuffed again. In act 3, at the start of Barnabas’ scene, you can see a passing figure through the slats in the door next to him. Old Inert Eagle is played by Erica Fitz, who appears in two episodes of Dark Shadows. Before this, she’d appeared in an episode of Hawk, a 1966 series which I was not previously aware of. It starred Burt Reynolds as a full-blooded Iroquois who works as a police detective in New York City. The episode that Fitz was in was called “The Shivering Pigeon”. Fitz also played a waitress in a 1968 episode of N.Y.P.D. Fitz’s one film role was a small part in the 1969 Arnold Schwarzenegger movie Hercules in New York. Coincidentally, Hercules’ romantic interest in the movie was played by Deborah Loomis, another Dark Shadows day player who appeared in summer 1969 as werewolf victim Tessie Kincaid. A little sound effects note: When Carolyn calls to Danielle’s spirit, they use the same laughing sound cart that they often use for Angelique. Also, in case you were wondering, the four unsolved murders in 1967-68 that Barnabas is responsible for are Jason, Dr. Woodard, Sam and Dr. Lang. 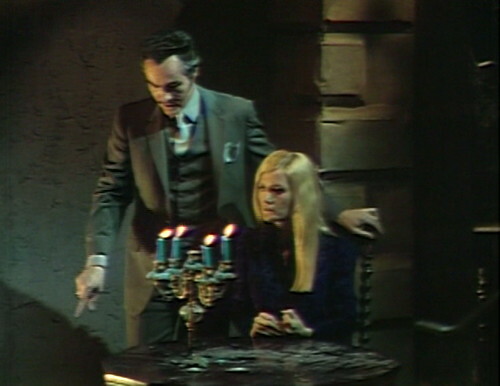 Technically, Angelique killed Dr. Lang, and Sam was blinded by Angelique and then killed by Adam, but only after Barnabas specifically invited them into his weird schemes, knowing how dangerous it would be. I’m not putting Tom’s death on Barnabas’ rap sheet, because that was Nicholas acting pretty much on his own. Barnabas is indirectly reponsible for Nicholas being in Collinsport in the first place, but he didn’t even know Tom. I’m also not counting the several unexplained cow deaths from early in Barnabas’ career. The infamous “Carolyn’s dead” cheat stands in contrast to what the series would become less than a year later when storyline progression actually happened. 1795 suffered a bit from prequel-itis in that even when something big narratively would occur (Joshua discovering Barnabas’s coffin), it felt like ticking a box on a checklist. We knew going in this — or something similar — would happen. But Trask exposing Barnabas and Barnabas going on the run. Wow! Something that BUFFY and, to a degree, ANGEL did that I enjoyed would be to introduce the storyline antagonist and then sometime later pull the rug out with an even more sinister one. Eve could have served a similar purpose but she simply functions as a plot point from here on out. Speaking of ANGEL, it occurs to me that Adam reminds me a lot of the character Connor, who when he showed up as a teen on the show had some “cute guy” appeal but quickly squandered it with a combination of whiny petulance and brain-dead idiocy (always trusting the wrong person and never trusting the right person). He really is a lot like Connor. Right down to Adam protecting Eve like Connor protected Cordelia. Both duped into it of course by some insincere romantic notions. I was confused about this whole story when I last watched these episodes – is this what Danielle Roget/Leona Eltridge was really supposed to look like? Because later when Danielle (In Eve/Marie Wallace’s body) goes back in time to 1795 to recapture the love with Peter Bradford wouldn’t she actually look like this actress – how did Peter recognize her in Eve’s body? Maybe we can discuss further when we actually get to the actual episodes dealing with Eve’s return to the past (courtesy of Angelique)..
What’s even more frustrating about Carolyn’s death/resurrection is that it actually led to a rather important moment in Barnabas’ development: for the first time (pretty sure), he’s willing to take responsibility for his actions and face the consequences, not for revenge or other petty reasons, but in order to benefit others. This should have been a big deal for the character but instead it gets lost under a sea of ludicrous plot twists. The Collins family never learns Adam is an artificial creation nor that their lives were at risk in any way. This needlessly sacrifices drama. You could have Barnabas confess his role in Lang’s experiment and even that Adam forced him to create a mate without the family also learning that he’s a vampire (presumably a series ending revelation from the writers’ perspective). And then you could have Carolyn walk into Collinwood healthy but with little memory of the experiment. You’d avoid killing her but you could deliver somewhat on the dramatic possibilities. I don’t think there was ever any tension between Barnabas and the rest of the Collins family until arguably Roger snapping at Barnabas during the Quentin’s ghost story. Compare this to 1897, 1970 PT, and 1840 — I sound like a broken record but those storylines popped because there was conflict and tension between the cast. Roger was also testy about Barnabas’ frosty demeanor toward Cassandra, enough for him to forbid Barnabas from visiting the big house any longer if he didn’t show her the respect that Roger thought she deserved, but of course little could he have known about the reason for Barnabas’ antipathy toward Cassandra to begin with. By the way, I don’t know if anyone has noticed, but the title of today’s post is an anagram. Danielle Roget = Leona Eltridge. I thought this was some cultural reference I was too old to understand. The titles of each part are also anagrams. 4 Danielle Roget (Leona Eltridge), because ‘eating old reel’ makes no sense. When Nicholas told Carolyn he was going to summon the spirit of someone who’d died nearly two centuries earlier, did anyone else think he might have been talking about Josette? Now that I think of it, that would have been quite something. Imagine how Barnabas would have reacted to Adam pairing off with a reincarnation of his true love! I just want to say that I love your blog and find it hilarious and incredibly insightful. I also enjoy the many comments from your readers.